If Jupiter actually resides in your lagna, that's the best. Otherwise, there's still hope. You just need to make an extra effort. Here's how. Each location (house) in the chart signifies specific qualities and activities. A house reflects the Sun's position vis-à-vis the eastern horizon so house positions remain fixed. For instance, the first house (lagna) will always represent where the Sun would have risen at the time of birth. So, in a north Indian chart, it will always be found as the rectangle at the very top middle of the chart. Here you see it marked as AS (ascendant), which is the western term for the lagna. The lagna captures the essence of a person and stands as the single most important house in the chart for it gives you insight into health, personality, attitude, appearance, vitality and intelligence. Quite a snapshot! Likewise, the fourth house maps to midnight, the seventh house to sunset and the tenth house to midday. And, just as for the first house, these all have fixed positions in any chart. All other houses just fill in the gaps of this scheme. As an instance, in the above chart, the fourth house is the box at the left numbered "4." In contrast, stars remain fixed in the firmament. But since, the earth spins and moves, it appears that the stars constantly shift between the houses. For example, the sign, Leo, might be on the eastern horizon at 10 am and on the zenith (highest point which corresponds to the Sun at midday) four hours later at 2 pm. This means that you can have any constellation in your lagna. It all depends upon the place, date and time of your birth. So, two levels of analysis figure prominently in any chart reading. First, and most importantly, the houses along with their planetary guests and rulers need to be considered. For instance, the chart above shows that the first house (lagna or AS) has no planets in it but the number 1 means that the planet Mars is the ruler (owner) of the house. A second level of interpretation would then interpret what additional bearing the constellations bring to the table. Continuing the example: the constellation, Aries, is associated with the lagna in the above chart so the qualities of this group of stars would factor into the final interpretation. In essence, houses relate to earth (and solar system) energies while constellations relate to stellar (deeper space) energies. Both levels of influence matter but for general purposes, as well as the beginning stages of spiritual practice, it's most useful to attend to the houses and planets first. Here's a practical example of how to energize your body and strengthen patterns of qi flow that correspond to Jupiter (Guru). If this planet lies in your first house (lagna), then well and good. Otherwise, the fires of Guru energy need to be stoked. One way to do this aims to harmonize the related constellations. It turns out that each planet acts as lord (ruler) of one or two constellations. For instance, the Sun rules one set of stars, Leo. In a similar fashion, Jupiter rules Sagittarius (justice, law, higher education, good luck) and co-rules Pisces (things that require time and energy, compassion, spirituality) along with Ketu (the south node of the Moon). Now, the houses and constellations express a harmonic relation to the human body itself so one can tune in to them via the acupuncture meridians. By balancing the qi (energy) flows in the meridians related to Sagittarius and Pisces, you can activate a resonance with the planet Jupiter (Guru) itself. The best way to do this makes use of special relations between the constellations. There are several important groupings but the one discussed here can be seen from the picture at the left. If you count left to right, starting at the top row and working your way down, you will get the pattern. Just pick every third constellation. So, the first one is Gemini, followed by Virgo, Sagittarius and Pisces. This grouping includes the two constellations lorded over by Jupiter. Thus, by tuning and strengthening the body's meridian circuit related to this star grouping, a person gains access to Jupiter energy. Since it especially manifests as health, vitality and clarity (all qualities of the lagna) there will be a natural resonance to the first house. To nail this down, you can choose to practice at a time when one of the constellations in this grouping actually is in the lagna. 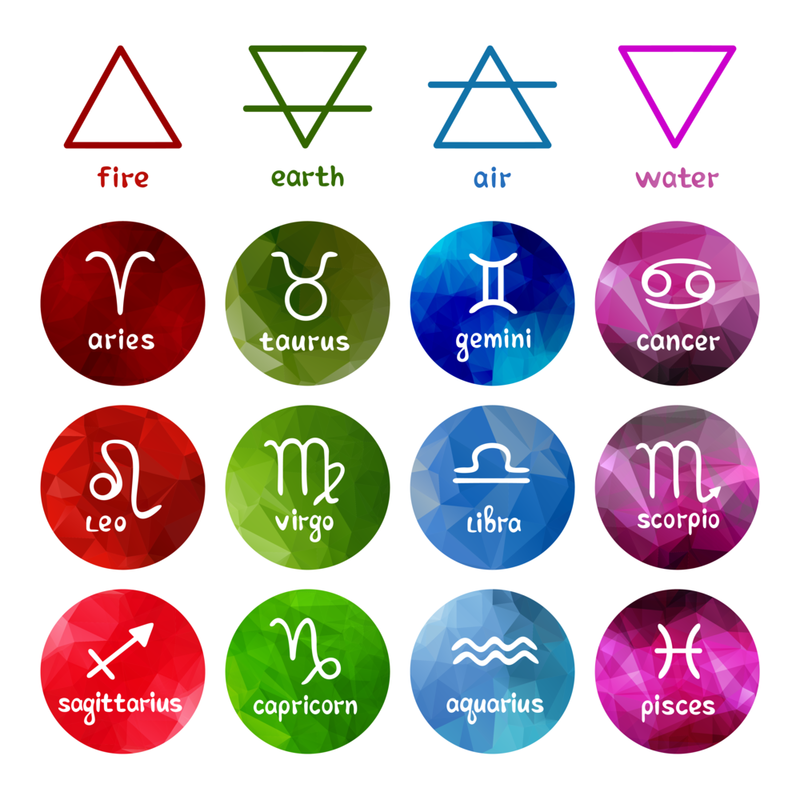 That is, every constellation is in the lagna for two hours each day so there are 8 hours each day when the connection from this grouping of four constellations (and hence, Guru) to the first house manifests best. Whew! If you’ve had a look at the practice, you can see that the techniques get quite zippy and zing all around in a rich tapestry of relations and flows. Rest assured the going gets easier the further along you go—some basic visualization and qi skills simply become habits that mostly perk along on autopilot. Thank goodness! There ARE easier sets to work with at this stage. Here’s one that’s still really useful but much simpler to implement—just a few steps and all of them within the reach of just about anyone. Or, you can check the Videos page for a number of qigong routines at various levels of skill. Just choose something that suits and dive in. You will find that your practice gradually takes a life of its own as you begin to tune in more to nature and overarching Spirit.